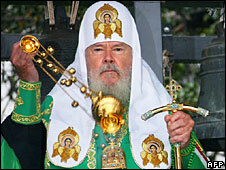 The head of the Russian Orthodox Church, Patriarch Alexiy II, has died at the age of 79. There is no word on the cause of his death at his residence outside Moscow, but he had been sick for some time. No date has been set yet for the funeral. Prime Minister Vladimir Putin called his death a "great loss". Alexiy II was credited with helping restore the moral authority of the Russian Orthodox Church after decades of repression under communism. Favoured by the KGB as he rose through the Church's ranks, he then oversaw its post-communist revival. However, relations with the Roman Catholic Church remained frosty and he repeatedly refused to meet the late Pope John Paul II, or his successor, Benedict XVI. 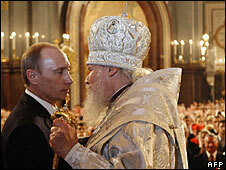 The Russian Orthodox Church counts nearly 70% of Russia's population - about 100 million people - among its members. The BBC's Richard Galpin in Moscow says Alexiy II was a hugely revered figure. Former Soviet leader Mikhail Gorbachev said he was shocked by the death. "I respected him deeply," he said. A spokesman for Russian President Dmitry Medvedev said he would return to Russia from India on Friday, cancelling a planned trip to Italy. By the age of 32 he was a bishop, by 35 an archbishop. After moving to Moscow he served as the Patriarchate's chief administrator and the deputy head of the Church's external affairs department. In the second post, he attracted criticism for what many thought was his unswerving obedience to the dictates of Soviet foreign policy. Supporters argued that he was merely doing his best to win concessions for his persecuted church. 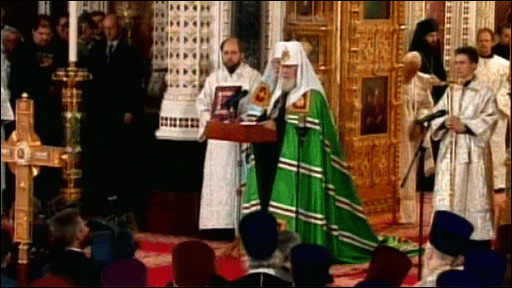 Alexiy II became the leader of the Russian Orthodox Church in 1990, shortly before the fall of the Soviet Union. In the new era of restored freedom and influence the church found itself with a prominent role rebuilding national self-esteem and morality in the post-Soviet period, our correspondent says. He insisted on his Church's right to be the sole national Church of Russia, bringing the scattered branches of the Russian Orthodox Church back under the control of the Moscow Patriarchate. He also moved the Orthodox Church closer to political circles, often visiting the Kremlin and aligning himself with its foreign policy stances. One reason for his differences with the Catholic Church was a dispute over land taken by the Greek Catholic Church from the Orthodox Church in Ukraine in the early 1990s. He also accused the Catholic Church of missionary activity in traditionally Orthodox areas, and blocked Pope John Paul II's long-held intention of visiting Russia. Relations improved after the 2005 election of Pope Benedict, correspondents say. The Pope said he was "profoundly saddened" by the patriarch's death. Last year, Alexiy II presided over a union with a branch of the Russian Orthodox Church whose members fled abroad to escape the Bolshevik Revolution. The ending of the 80-year schism with the Russian Orthodox Church Abroad was seen as a significant achievement for the patriarch. Alexiy II also oversaw a major programme to restore and re-open hundreds of Russia's churches. Michael Bordeaux, founder of the Keston College religious research centre, said he had been a "very strong patriarch". "The bishops appointed under Patriarch Alexiy are very much of his mindset - he's been ruthless in suppressing alternative views in the Orthodox church."